Maccaferri gabions and geogrids were used for three different works located near rivers in Macedonia and Albania. When construction works are located beside or in the vicinity of a river, Maccaferri often comes to minds as a supplier of hydraulic solutions. Over recent years, Maccaferri has implemented many projects within many market sectors from mining to infrastructure and also into emergency works as well as for golf courses and agriculture. A graded logical range of hydraulic protection solutions are available from Maccaferri to satisfy the clients technical and commercial requirements. Three recent hydraulic projects that can be linked to the hydraulic sector exemplify aptly Maccaferri’s ability to mitigate the dangers caused by water bodies—large and small. The first of the three works was located near the Shushicë River in southern Albania. 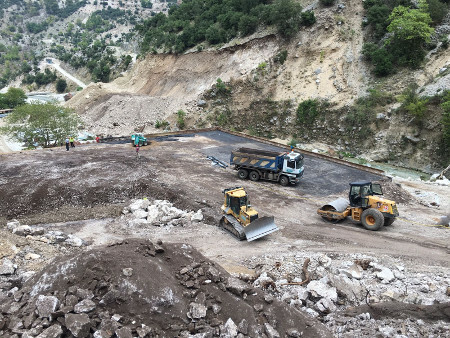 Balili Construction, sought out Maccaferri Balkans to help them tame the river during times of heavy precipitation. For this work, currently still under construction, Maccaferri is providing gabions made from double twisted steel wire mesh type (8×10 type mesh) and geogrids as soil reinforcement measures to stabilise the base and the green revegetating façade that featured Biomac SC. project, Maccaferri supplied Reno Mattresses and gabions as longitudinal protection to the river and additionally Green Terramesh which was installed to stabilise the slope and to provide the desired architecture from the surrounding landscape. The gabions and mattresses provided protection and channelling works for the river, stopping the hydraulic erosion, yet at the same time ensuring that this inhabited valley maintained its picturesque landscape. The third hydraulic project at the Zoo in Skopje, Macedonia stands out for its originality. The Zoo required a series of improvement works to be made between the animal cages and the watercourse channel flowing near the Zoo. The channel needed restoration as the existing river had a lot of materials in suspension, causing it to be brown and cloudy. This indicated excessive hydraulic erosion was taking place. The client of the project recognized the benchmark performance of Maccaferri gabion solutions and chose to use gabion baskets to successfully restore both the channel and the animal cages. All three projects serve to prove that Maccaferri’s core knowledge enables us to address hydraulic problems regardless of where they occur.